The $500,000 revitalization of Maverick Park at 1000 Broadway, a half-mile south of the Pearl, and just a few blocks from the near East Side, is a few months away. The project, which is being lead by the San Antonio Parks Foundation, includes an off-leash dog park facing Jones Avenue, picnic tables, drinking fountains, trash and recycle bins, more trees, new lighting, and a Portland Loo stand-alone restroom. 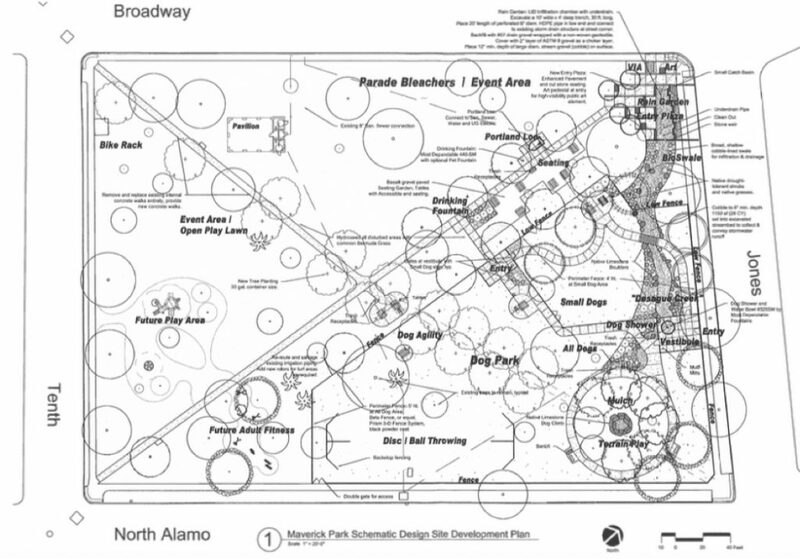 Future upgrades include a play area for kids facing 10th Street and a fitness area along Alamo Street. The project is largely funded by the 2017-2022 bond program. In the plans, the dog park alone takes up about a third of Maverick Park’s three acres and includes areas for small dogs and large dogs, agility training, disc and ball throwing, climbing and showering. The Historic and Design Review Commission will consider granting conceptual approval to the plans later this afternoon. Larry Clark, co-founder of Bender Wells Clark Design, the firm redesigning Maverick Park, anticipates City Council will vote on construction costs by April, with construction beginning in May or June. Construction is expected to be completed in July 2020, according to a bond projects map on the city’s website. Bender Wells Clark is also designing a bioswale for the park—a long, channeled trench that filters out pollutants, like pet waste and trash, from the rainwater before it flows into a water source, such as the San Antonio River, a block west of the park. The Portland Loo is the same type of restroom located at Lion Fields Park and across from the Torch of Friendship and will use a solar panel for its lighting system. Clark said more trees and plantation will be added to the park along with shaded seating areas, water fountains, improved sewer and water systems, fencing for the off-leash dog park, and pedestrian lighting replacement and installation. Existing, damaged sidewalks in Maverick Park will be torn out and replaced with new sidewalks made of limestone, basalt gravel, and cut stone. 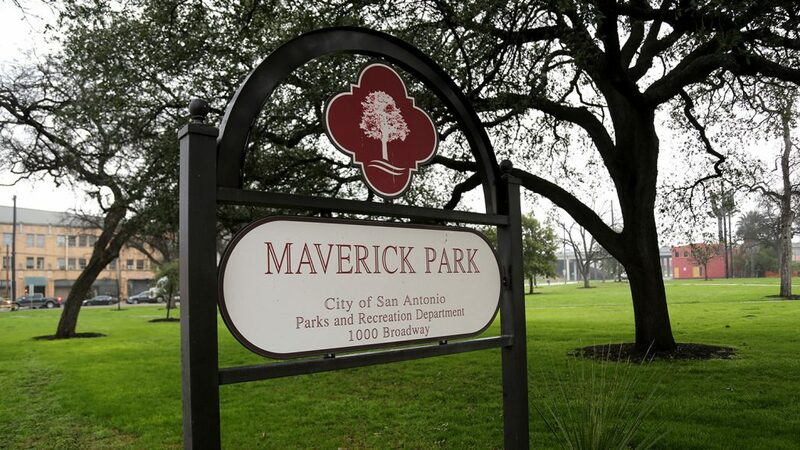 Since 2015, the parks foundation has lead an effort to establish a dog park at Maverick Park, along with improving its facilities. So far, several nearby residential properties such as Jones & Rio and The Mosaic on Broadway have contributed nearly $150,000, said Ashley Riley with AREA Real Estate, LLC, developer David Adelman’s firm, which is a project manager. Other sources include $350,000 in park improvement funds from the 2017-2022 bond program, and $50,000 from the Midtown Tax Increment Reinvestment Zone. Visit the Maverick Dog Park Facebook page.